Natural8, one of Asia’s popular online gaming platforms, is hosting online satellites to the upcoming APT Philippines 2019 Main Event. Players now have a chance to win a Main Event Seat worth US$1,050 from a buy-in of only US$150! The 4 satellites will run on March 31, April 7, 14 & 21, 2019. 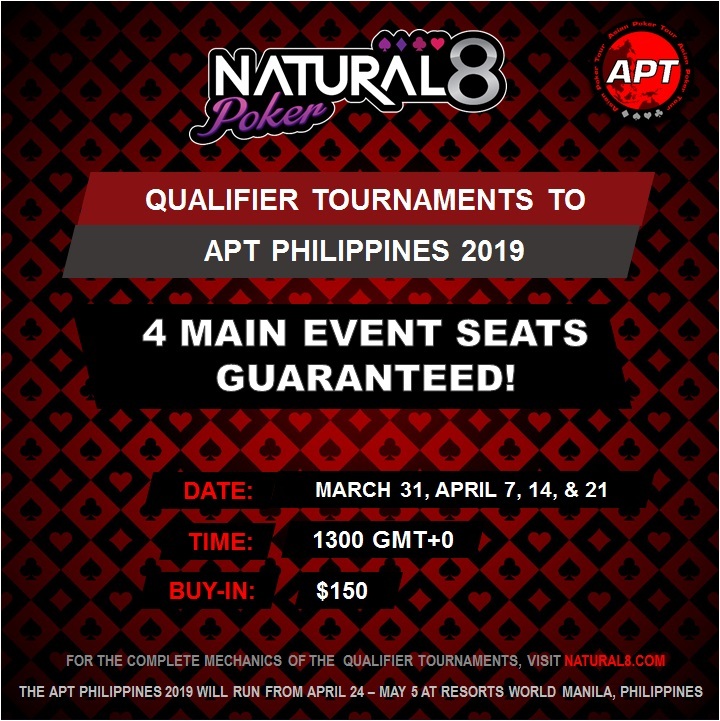 For the detailed satellite schedule and/more info, check out the Natural8 APT Philippines 2019 Main Event promo page. The APT Philippines 2019 will run from April 24 to May 5 at Resorts World Manila, Pasay City, Philippines. Check out the APT Philippines 2019 info page.